The ‘Everything But Arms’ (EBA) regulation of the European Union (EU) has been hailed as a groundbreaking initiative for developing countries. Since 2001 EBA grants almost completely liberalized access to the European market for products from the least-developed countries (LDCs). It quickly became the most symbolic European trade initiative towards the Third World since the first Lomé Convention in the 1970s. Given its central position in EU discourse and its continuing relevance for the European and international trade agenda, this book attempts to present a thorough analysis of EBA. 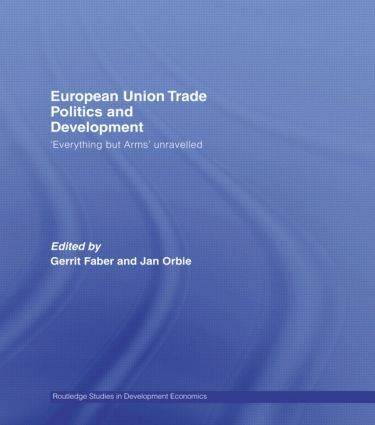 ‘European Union Trade Politics and Development’ contains contributions from a diverse range of scholars who collectively present a comprehensive picture of EBA. This volume also contains a broader analysis of EU trade politics towards the South, focusing on agricultural policy reform, Europe’s evolving relationship with ACP countries (ex-colonies from Africa, the Caribbean and the Pacific), it links EBA with Europe’s negotiating position within the World Trade Organization. Contributions to this volume also consider the continuing negotiation leverage of EBA within the Doha Development Agenda, make comparisons with United States trade policy vis-à-vis the LDCs, and focus on the economic effectiveness of EBA in terms of its stated objectives as well as on the institutional skirmishing within the EU. The least developed countries, international trade and the European Union: what about ‘Everything but Arms’? Bureaucratic competition in EU trade policy: EBA as a case of competing two-level games? EBA and the EU sugar market reform: development gift or Trojan horse? ‘Everything but Arms’ or all about nothing?